Irate Singapore users say on bike-share firm ofo's Facebook page that they are not receiving any responses regarding refund requests. With bike-sharing start-up ofo facing an uncertain future in China, users here are wondering what will happen to its operations in the Republic. On ofo's Facebook page - which has not been updated in almost two months - more than 170 comments have been left by irate Singapore users saying that refund requests have gone unanswered. The Consumers Association of Singapore said it had received three complaints against ofo about refunds in the last three months One user, Mr. Clearance Yeap, said his card was charged about $18 over two months without his knowledge. Though the 24-year old waiter managed to stop incurring further charges by deleting his card details from the ofo app, he was unable to contact ofo for a refund of the amount lost. "First, I can't get my money back from oBike. Now, ofo is also not going to refund my money, I guess," he said, adding that he no longer trusted bike-sharing companies. Bike-sharing firm oBike, which folded unexpectedly in June, was reported in August to owe users about $9 million in unrefunded deposits. Photographer Lim Yong Teck, who had paid $39 for a deposit last year, said he was unaware of ofo's financial situation. Though ofo briefly required a deposit from users last year, this was later dropped in favour of passes, which allow unlimited usage over a certain period for a flat fee. While Mr. Lim, 29, managed to get his oBike deposit refunded before the company closed in June, he is sceptical he can recover the funds from ofo. "I think it is probably impossible to get it back now," he said. ofo has scaled back its international operations and has faced multiple lawsuits from unpaid vendors The Consumers Association of Singapore said it had received three complaints against ofo about refunds in the last three months. Ofo did not respond to queries from The Straits Times. Yesterday, when ST visited ofo's registered address - a co-working space in Shenton Way - staff of other companies there said they had not seen anyone from ofo for several weeks. ST understands that Ms. Isabelle Neo, who previously headed ofo's Singapore operations, is now with e-scooter-sharing start-up Beam - founded by Mr. Alan Jiang, previously also with ofo as its South East Asia head. In China, more than 12 million ofo users are demanding refunds of their deposits of up to 199 yuan ($40) each from the firm. This comes after a year in which ofo scaled back its international operations and faced multiple lawsuits from unpaid vendors. Meanwhile, ofo Chief Executive Dai Wei said last week in a letter to employees that the firm was facing 'immense cash flow pressures' and had considered filing for bankruptcy. This is despite raising US$866 million ($1.2 billion) in March. Mr. Dai is now on a Beijing court's blacklist for defaulting on debts that, among other things, restricts him from flying business class or staying in luxury hotels. 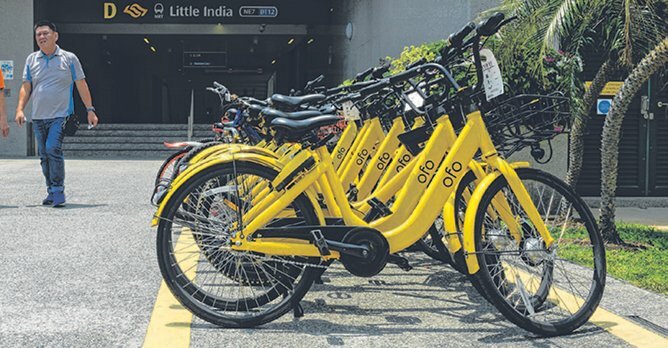 LTA said in October that the company had cited difficulty in meeting its financial obligations In Singapore, ofo had been allowed to operate 25,000 two-wheelers under the Land Transport Authority's (LTA) licensing scheme. It later requested that this number be slashed to 10,000. LTA said in October that the company had cited difficulty in meeting its financial obligations. The licensing fees for a fleet of 10,000 bikes amount to about $600,000 for a year. 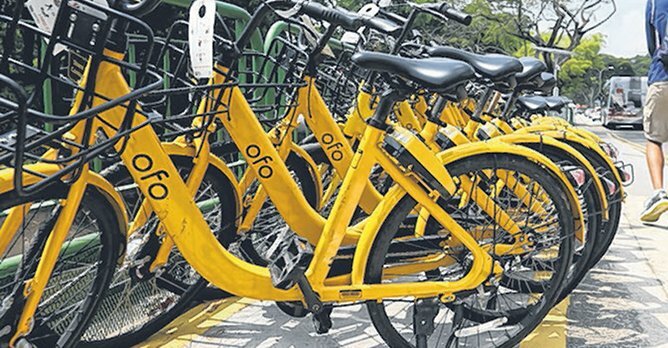 Besides ofo, five other companies were awarded bike-sharing licences - Anywheel, GrabCycle, Mobike, Qiqi Zhixiang and SG Bike. 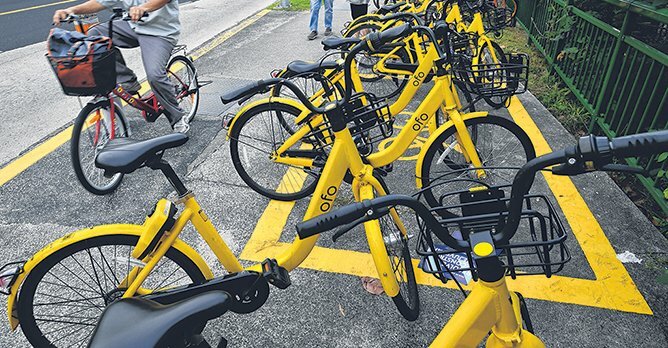 Ofo's situation points to the lack of viability of the bike-sharing model, which is heavily dependent on venture capital, according to Singapore University of Social Sciences Transport Economist Walter Theseira. Competitor Mobike was bought by Chinese food delivery giant Meituan Dianping to the tune of US$2.7 billion earlier this year. However, such a lifeline may not be on the cards for ofo, said Associate Professor Theseira, noting that the debts it is racking up make it a far less attractive prospect. "The (prospective buyers) have to ask themselves, given the over-capacity in the market, are they buying a player that has a strong chance of outlasting the rest?" he said.